Casual games. Coffee-break games. Web games. Call them what you will, they're big business and getting bigger. Which is why distributors of the tiny video games -- like Microsoft, AOL, and Yahoo -- are poised to expand their services even further, proving they're not just playing around. ...according to a study conducted for AOL, female gamers over 40 spend the most hours per week playing online games -- 9.1 hours or 41% of their online time vs. 6.1 hours or 26% for men. Women seem to enjoy the word and puzzle games that are common on casual game sites (compared to the sports and shooting games that men prefer). And they play to relieve stress and to chat with other online gamers, "much the same way that people sit around a card table and play and talk, when they are there primarily just to talk," says Matthew Bromberg, general manager of games at AOL. I used to love the Paul Reiser-Helen Hunt sitcom "Mad About You". It was a must-see weekly appointment. And this was in the days before TiVo, when you had to be there or miss it. But I stopped watching when the series ended. It's a weird thing, but I don't like to watch syndicated episodes of a series that's no longer in production. For example, I used to watch Friends 6 or 7 times a week until the prime-time version ended, and I haven't watched a single ep since then. On a related thing, I never watch Series Finales. Too depressing. I don't like the finality of it. I still haven't watched the last eps of Friends, MASH, Barney Miller, to name a few. But my TiVo recorded an ep of Mad About You just now, and for the heck of it I watched. Boy was that show great. Great characters, great chemistry, great writing. Funny and real. Maybe I'll ask my TiVo to record more and I'll see if I can handle it. SAN DIEGO - Rep. Randy "Duke" Cunningham, an eight-term congressman and hotshot Vietnam War fighter jock, pleaded guilty to graft and tearfully resigned Monday, admitting he took $2.4 million in bribes mostly from defense contractors in exchange for government business and other favors. I was kinda shocked to discover, during my Thanksgiving hometown visit, that they've torn down my old High School. Both of my elementary schools, and my Junior High, have all been condos for years. And this High School building became the Middle School years ago. But now they've torn it down. It was disturbing enough to drive by and see that it was gone, but seeing these demolition pics is even worse. Easily amused, but it excited me to see gas for $1.99 a gallon at the local Irving. Redsox trade Ramirez, the other one. The Redsox are finalizing a trade with the Florida Marlins the acquire Josh Beckett and third baseman Mike Lowell, in exchange for highly touted shortstop Hanley Ramirez and minor league pitchers Anibal Sanchez and Jesus Delgado. For the past few years Hanley Ramirez has been presented as the future of the sox. And now he's gone. From digg.com, I came across this Google Maps Hack. 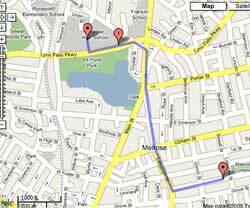 It lets you measure the distance of any route you can trace using the Google Maps system. 1.18 miles. Uphill both ways. I would have made them clean up before they got into my helicopter. Hey, we finally got another naked fat guy on Survivor! Other that that though, Judd didn't look at all happy being off on Reward with those guys. During the Reward Videos Gary is thinking, "please don' t mention I'm a football player, PLEASE don't mention I'm a football player... Phew!" Cindy was a gamer during Immunity Challenge! Almost won it. Jamie voted out, and onto the Jury. Alone with BobbyJon for now. We may get to see them fight after all. I've begun a new round of improvements to my GEWF forum board. Let the whining begin. One of the first substantial studies to test it like a drug instead of just asking people how much of it they consumed found higher blood levels of cholesterol-precursor fats in those drinking decaf vs. regular coffee or none at all. More than half the reason I've been trying to learn about Windows and Intel computers is my excitement about the forthcoming version of the Mac OS which runs on the Intel. Apple's insistence notwithstanding, I'm convinced that OS X, on generic Intel hardware, is the future. Extreme Tech magazine published this report on their experiments building, and running OS X on, a generic box. It's going to be an interesting couple of years for the Apple platform. Most of the buzz might be happening on the iPod front, but for those in the know, the move to the Intel platform could easily represent Apple's biggest gamble yet: It's equivalent to betting the farm. Judging by what we've seen while putting together this story, we think Apple's transition will go over really well. OS X already runs great, and we're still more than half a year away from Intel Macs. For more than a year, a package of Cambodian tapioca sticks sat in my pantry unopened. Then one evening, I Googled my noodles and ate them. Google, the almighty Web search engine, is my encyclopedia, dictionary, shopping mart, even private investigator. So it seemed natural to type in "Cambodian tapioca noodles" and see what recipes Google could rustle up. And rustle it did. I spent some time this afternoon in Montpelier, one of my favorite towns in Vermont. It's the state capitol. I visited a downtown coffee house called Capitol Grounds, where two of the shop specials were "Bob's House Blend" and "Bob's Senate Blend". Eventually I will post my comments on last week's Survivor ep. But for those anxious to discuss it in the Forum, here's a place to start. I'm in Vermont for a few days for the Vermont Lodging & Restaurant Showcase, a trade show that a client of mine is exhibiting at. We're rolling out some things that I'll finally be able to talk about a little. We have high hopes for this one. Jason Varitek finally can call himself a Gold Glove catcher. The captain of the Boston Red Sox was one of three first-time players named to the American League Gold Glove team on Tuesday. 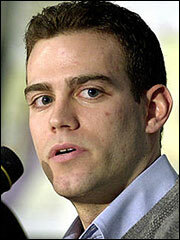 I may write more about this later, but a quick post to say, it's notable that, Redsox General Manager Theo Epstein -- the boy-wonder who in three years led the Redsox to three post-season appearences, including the teams first World Championship in 86 year -- has decided to leave the team. WASHINGTON, D.C. - A federal inspector general has found that a secret and controversial agreement between Wal-Mart and the U.S. Department of Labor, signed in January, was the result of "serious breakdowns" in the Labor Department's normal procedures and resulted in an agreement that was "significantly different" than other agreements signed by the Department. The investigators also concluded that the agreement has brought significant benefits to Wal-Mart while weakening future federal oversight of labor practices at Wal-Mart. The breakdowns resulted in Wal-Mart being able to author "key provisions" of the agreement, reached after the Labor Department found the company had violated child labor laws at operations in three states, the IG reported.